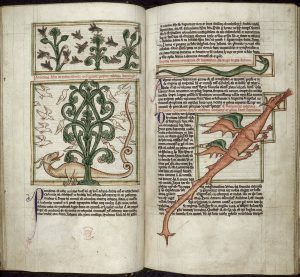 In medieval bestiaries, dragons killed elephants, feared panthers, and brought horrible illnesses. The dragon, so closely identified with the medieval era in fantasy tales, is one of literature’s most iconic beasts. 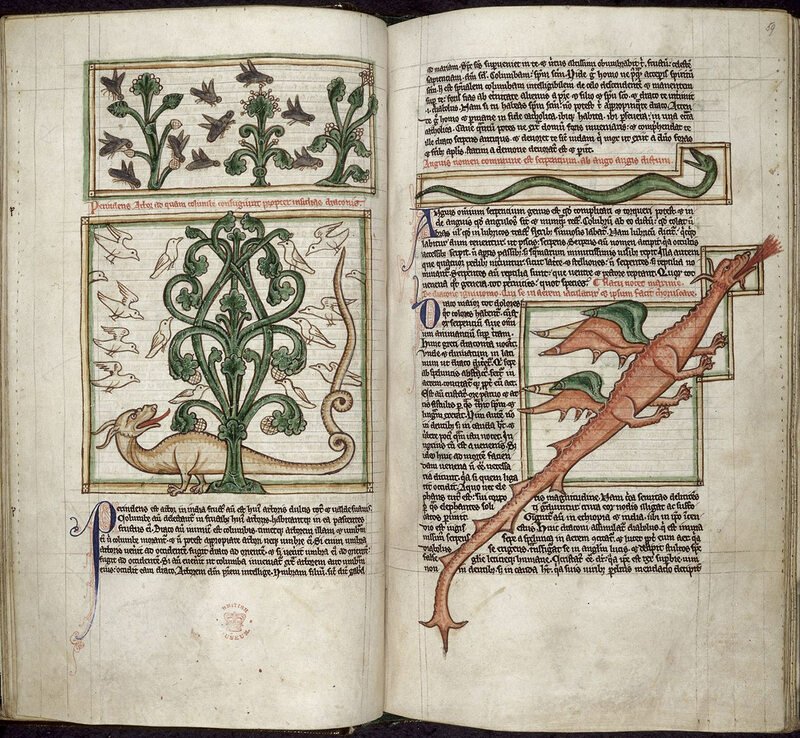 The bestiary, a type of illuminated manuscript featuring stories and biblical lessons about animals, depicts the dragon as the bearer of death and misfortune or as the incarnation of the devil and evil. 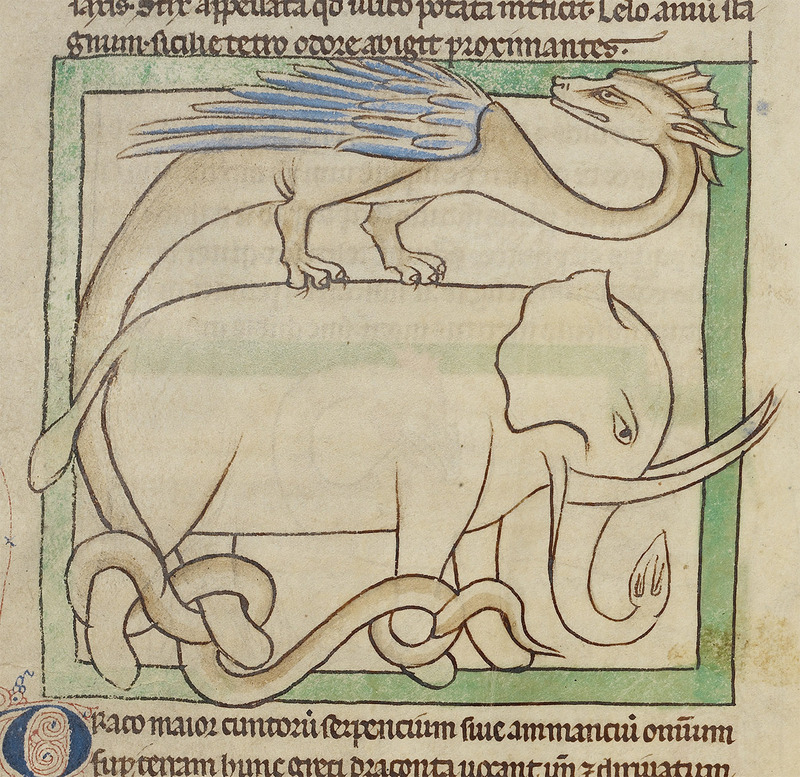 One dragon story told in the bestiary involves the elephant. As the female elephant gives birth in a pond, its mate stands guard to protect the mother from their enemy, the dragon. The dragon is elephants’ only enemy because it is the only creature capable of killing it. 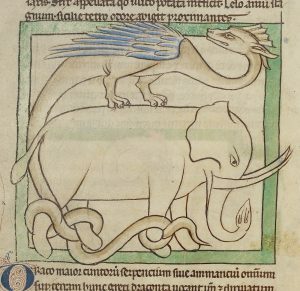 The dragon successfully kills elephants by hiding in a tree, hidden by foliage. When an elephant crosses underneath, the dragon swoops down, coils its tail around the elephant’s neck, and strangles it to death. The elephant gives birth in water to ward off such a threat. The story of the dragon and the elephant reveals that the devil (the dragon) is always lying in wait; the good Christian (the elephant) must keep watch. Another dragon story involves the panther, which is a symbol of Christ. After consuming a large meal, this large cat is said to fall asleep for several days. Upon waking, it lets out a roar with a fragrant odor that attracts all animals—except the dragon, which flees in fear to hide deep within the earth. Once again the dragon represents the devil, this time cowering in fear in the face of God. Stories from Christian texts also portray the dragon in satanic fashion. In Revelations, the archangel Saint Michael kills a ferocious dragon and banishes it from heaven, paving the way for Christ’s Resurrection. In a popular Christian saint story, a Roman soldier named Saint George arrives at a pagan community called Silena while in Libya in the third century AD. There, he finds the king and his people about to offer the king’s own daughter to a dragon. George saves the princess, stuns the dragon with his lance, and orders the princess to bind it with her girdle. He then brings the helpless dragon to town where he demands that the inhabitants convert to Christianity or be killed by the dragon—which he later slays. In the Middle Ages the dragon was almost always associated with the devil and Satan, the serpent of all evil; numerous stories portray the dragon as the bearer of evil, death, and misfortune. Yet surprisingly, many dragons in the medieval bestiary are not the large, scaly, fire-breathing beasts we’re so familiar with. Artistic depictions of the dragon differed greatly depending on the artist and the time period: some were huge, some small; only some breathed fire; some were shaped like humans, and still others were long and slender. In fact, many medieval artistic representations of the dragon could easily be mistaken for real animals such as snakes or crocodiles. The dragon, therefore, could be visually manipulated to suit not only the inclinations of the artist, but those of the viewer as well. 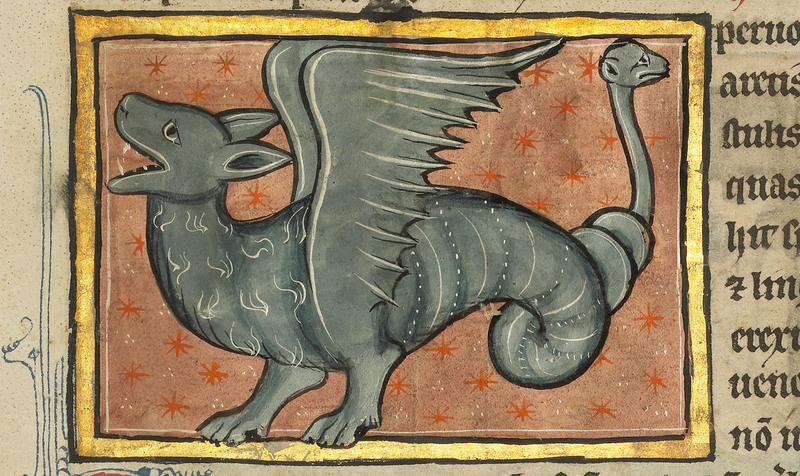 In the real world of medieval Europe, people feared dragons too. One belief was that urine from dragons flying overhead would putrefy human skin, causing the affected area to fall off completely. Dragon’s breath was also said to poison wells and streams. Further, no mortal being could ever interact with a dragon; dealing with them was only for gods, angels, saints, and heroes. Dragons have a varied, vibrant history of representation in European art. 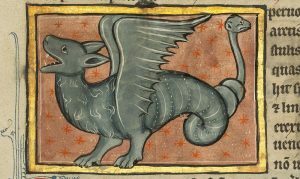 And the dragons we find in medieval manuscripts, in particular, are often quite different from the ones familiar to us from fantasy books and movies today.